Manufacturers advertise handheld sewing machines as a quick way to make a simple repair to a hem or stitch a small and easy project without getting out a bulky sewing machine. While a handheld sewing machine may not be the ideal choice for a large or intricate sewing project, you can use one to finish up a project or keep one on hand backstage for costume repairs. Stitch many all-purpose fabrics including cotton, polyester, silk and nylon with a portable battery-operated handheld sewer. Thread the handheld sewing machine and insert batteries according to manufacturer's instructions. Turn the machine off or make sure it is on "lock" for safety. Turn the rotary wheel in either direction to lift the needle. Place the fabric you want to stitch under the presser foot or bar. Pull the thread through the needle with your left hand until you have a "tail" of thread a couple of inches long. Hold the fabric you are stitching in your left hand and the sewing machine in your right hand. Turn the machine on and unlock it. Guide--don't pull--the fabric through the machine with your left hand to stitch. Stop the machine and lower the needle into the fabric using the rotary wheel to pivot around corners. Stop the machine at the end of your stitching and raise the needle to its highest position using the rotary wheel. Lift up the presser foot or bar. Pull your fabric away from the machine to the left, taking care not to unravel the seam. Cut the thread about 3 inches from the fabric. Loop the 3-inch tail of thread into the last stitch using your fingers or a threader and tie a knot to prevent the seam from unraveling. Adjust the tension wheel on the handheld sewing machine if the stitches are too loose or too tight. Practice on a sample piece of fabric similar to your project to find the best tension. Check and replace the batteries if the machine slows down during a project. 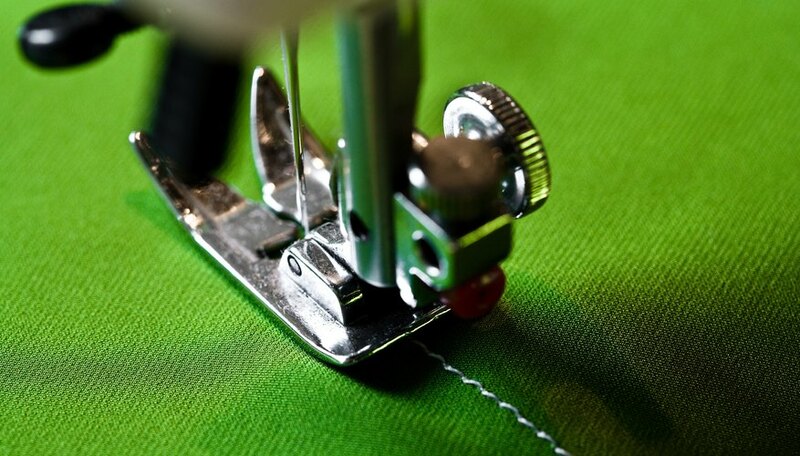 Do not pull or drag the fabric through the handheld sewing machine to avoid damage to the needle, machine and fabric. Never try to move the needle up or down with your fingers; always use the rotary wheel.